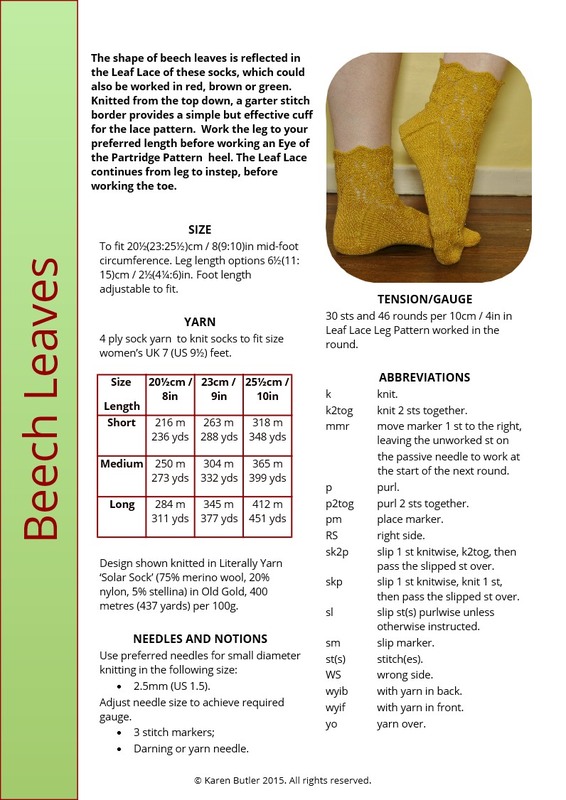 This beautiful Beech Leaves sock pattern has been created by Karen Butler Designs (who also produces Literally Yarn) and is available as an online download (VAT inclusive). The shape of beech leaves is reflected in the Leaf Lace of these socks. Knitted from the top down, a garter stitch border provides a simple but effective cuff to the lace pattern. Work the leg to your preferred length before working an Eye of the Partridge Pattern heel. The Leaf Lace continues from leg to instep. The Leaf Lace is charted separately for leg and instep. Written construction details include the Eye of the Partridge Pattern. Pattern layout options are included for both A4 and letter size papers. The pattern is downloadable in pdf format and can be viewed using Adobe pdf reader. A copy of this software is available at http://get.adobe.com/uk/reader/. Images have been provided by Karen Butler Designs. If you are a member of Ravelry and would like this pattern to appear in your Ravelry Library, please let us know your Ravelry username when you place an order. Sized to fit 20½(23:25½)cm / 8(9:10)”ankle/mid-foot circumference. Options for 6½(11:15)cm / 2½(4¼:6)in leg length. Foot length is adjustable to fit. Preferred needles for small diameter knitting: 2.5mm. c. 216 metres /236 yards to 412 metres /451 yards sock weight yarn, depending on size and length. Tension 30 stitches and 46 rounds in Leaf Lace Leg Pattern on larger needles for 10cm/4 inch square. 3 stitch markers or small safety pin; darning / yarn needle. Design shown knitted in Literally Yarn ‘Solar Sock’ (75% merino wool, 20% nylon, 5% stellina) in Old Gold, 400 metres / 437 yards per 100g. The yarn used is hand-dyed Literally Yarn, which is only available in small quantities in any colour. Literally Yarn 'Stellar Sock' and 'Nebula' Sock are alternatives.